Our goal for Halloween this year became making it especially memorable. We chose to keep Pookie home from school the day her classmates were vaccinated against H1N1 with FluMist and for 48 hours after the dosing - as FluMist is a live virus administered in the nose, and the virus sheds for 1-2 days after it is given. Because no one in our household can receive FluMist - and the standard shot option was yet to become available - we opted to keep the boys out of school, as well. Unfortunately, it was Halloween Party Day. See our Princess Leia, Karate Master, ex-Elmo, and Fruitbat with their dad? Our view of the Magnificent Mile from our hotel was spectacular! We spent hours staring out the window, watching cars drive past - even a few boats floated by on the Chicago River! The best was when all four kids gathered around the window to watch the city lights while they drifted off to sleep! 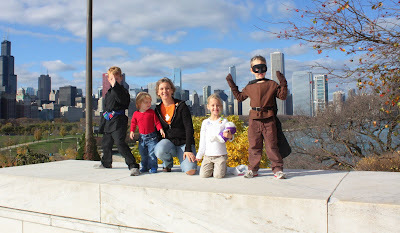 We visited Shedd Aquarium - one of my absolute favorite places to visit in the world! She wants to swim with the dolphins in Australia when she's old enough - Don't worry, Sweetie. So do I. So do I. We shopped downtown and ended Halloween with a glimpse of the Navy Pier's final fireworks show of the season! 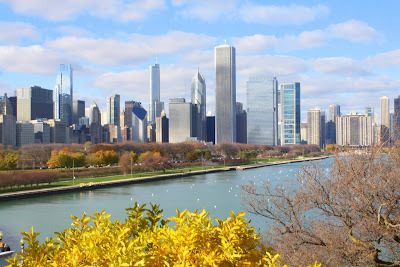 Add to that a trip to The Museum of Science and Industry, Gino's deep dish pizza, the Rock-n-Roll McDonald's, and the John Hancock Skydeck, I think it was definitely a Halloween (weekend) to remember!